Andrew Sprogis is Katten’s Chief Innovation Officer and drives the firm’s strategy to be a leader in the changing legal industry. Andy and his team work with the firm’s clients, attorneys, and professional staff to encourage new thinking and processes around structure and scope of client relationships and the firm’s role in the marketplace. 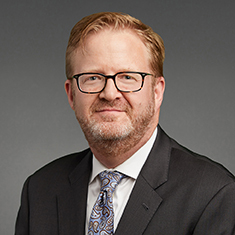 Andy was formerly the firm’s Executive Director, where his responsibilities included pricing, compensation, budgeting, real estate and operations, change management, information governance, and human resources and benefits. Additionally, he worked with the firm’s Board of Directors and Executive Committee to improve and innovate service delivery and increase efficiencies using technology and refined processes. Prior to becoming the Executive Director, Andy served Katten as its Director of Business Planning. In this capacity, he liaised with firm leadership across all major functions to develop and implement strategic growth plans. Andy is the Chairman of the Board of Directors at Easterseals, a non-profit organization serving individuals with disabilities and their families in metropolitan Chicago and Rockford.